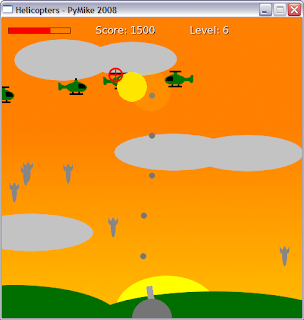 Pygame is a cross-platform set of Python modules designed for writing video games. It includes computer graphics and sound libraries designed to be used with the Python programming language. It is built over the Simple DirectMedia Layer (SDL) library, with the intention of allowing real-time computer game development without the restraints and low-level mechanics of the C programming language and its derivatives. This is based on the assumption that the most consuming functions inside games (mainly the graphics part) can be completely abstracted from the game logic in itself, making it probable to use a high-level programming language like Python to structure the game. Shoot the helicopters and the bombs they drop before they blow up your base! 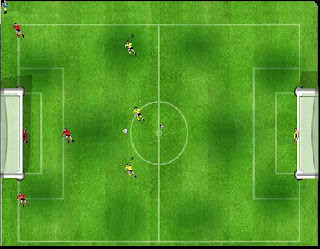 The game is a standard soccer with three players and a goal keeper. The players are named 1, 2 and 3. By using the number key on the keyboard you can switch/pass the ball to the player. The arrow keeps provide a mechanism to move the player around. The game runs for duration of 5 minutes. The goalkeepers are automatics and need not be controlled. 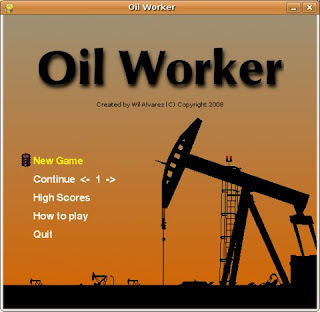 Oil Worker is an addictive and challenging arcade puzzle game developed in PyGame. You've been contracted by an oil company and your goal is to build a long pipe to carry the oil from the oil well to the refinery. 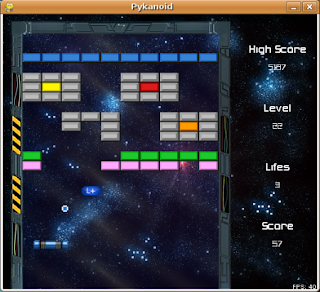 Pykanoid is an Arkanoid clone game developed in Python/PyGame. It consist on a bouncing ball that player must control with a bat and try to destroy all blocks in the screen. It has powerups to enhance ball and bat. 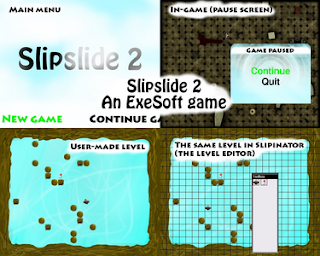 Slipslide 2 is a simple puzzle game where the goal in each level is to get to the exit by sliding between obstacles. When you start moving in a certain direction, you can't stop or change direction until you hit an obstacle or a wall. And to add to the difficulty, some levels have holes in the ground which make you restart the level if you fall into them. There will be twenty-five different levels, all linked by a story that sees the main character trying to get to an ice-dancing competition in Antarctica. 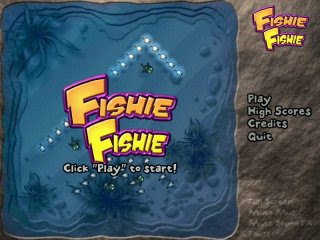 Fishie Fishie is a kaliedscope of high speed sea food, featuring a challenging one button fish control system, lovingly hand illustrated fish, fish related poetry, and fish. Visit Pygame.org for more info, to download and to see the documentation. There, you will also find tutorials and list of projects that make use of Pygame. Hey, Fishie Fishie wasn't built with pygame! It's just listed on the pygame site 'cos it uses python. It's actually running on pycap, which is a python layer on top of the PopCap game framework. Actually there is another emerging library like pygame that can be used to make games. I have done a comparison between pygame and pyglet in my blog.